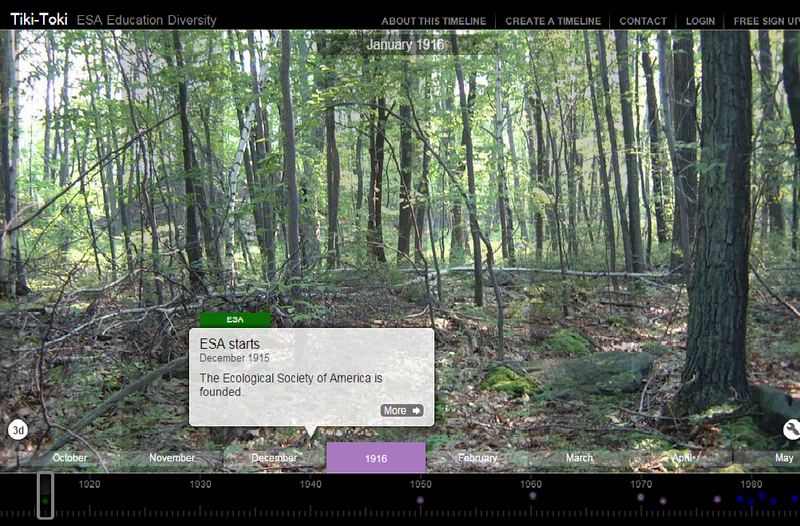 Timeline for Education and Diversity Accomplishments in ESA. This timeline traces the ESA’s many accomplishments relating to education and diversity since the society’s founding in 1915. Included are major initiatives, profiles of award winners, information about key publications, and accomplishments of the Sections and Offices dealing with education and diversity. The purpose is to allow viewers to trace the evolution of ideas and initiatives relating to education and diversity, especially during the past 25 years. The timeline was developed by members of the Committee for Diversity and Education; the advisory group included Ken Klemow (Wilkes University), Carmen Cid (Eastern Connecticut State University), Julie Reynolds (Duke University) and Teresa Mourad (ESA). Laura Solomon (Wilkes University) served as the technical associate. Financial support was underwritten by ESA’s Centennial Committee. We welcome suggestions for additional items worthy of inclusion, as well as corrections of any errors. Please submit those suggestions to Ken Klemow (klemow@wilkes.edu).